Thanks to all of you that joined us for our last challenge! Wow! You guys are amazing!!!! I was inspired by that pretty pink rose and the valentines. I haven't made rolled paper roses in such a long time! I had forgotten how much I love them! These roses were made with some older MFT Die-Namics dies. I die cut two hearts-one with pink polka dot paper and the second with white vellum. The background was embossed with a heart embossing folder from the Paper Studio. I think this card is so sweet! This just might be my hubbies! Oh, this is just darling, Mackie! Love those pretty rolled flowers. 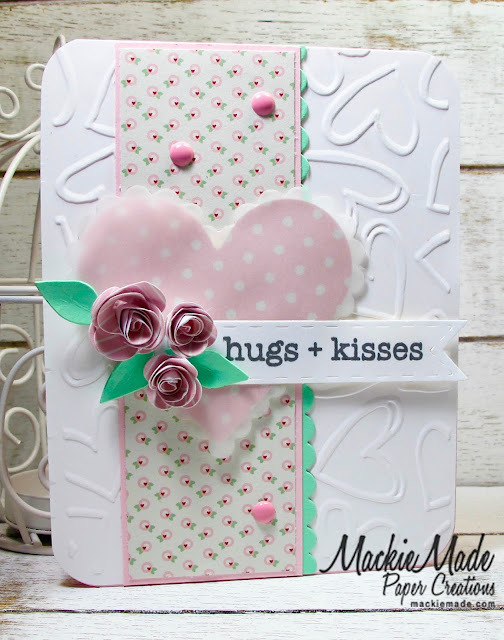 Your rolled roses and polka dot heart add up to sweetness Mackie! Darling card! So pretty and sweet, Mackie!! You did a great job with the rolled flowers! I haven't done them in ages myself. But, they do look so pretty!! Beautiful and romantic. Love your little handmade roses. Mackie, this is darling! It's so whimsical and romantic and I love the soft color palette too! Beautiful! OMGosh I LOVE this! The layers, the vellum, the rolled roses...!!! So YUMMY, Mackie! I haven't rolled roses in forever either! YOU have inspired me! So very soft and pretty Mackie! 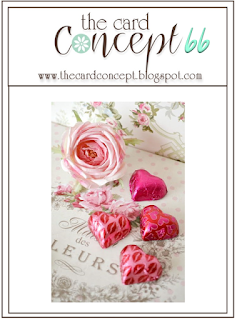 I love the heart embossed background and the gorgeous rolled flowers. Perfect in every way. This is so pretty Mackie - live how soft everything is and those roses are gorgeous. I've never tried making them - I should give'em a try - they look so pretty. Oh I love the soft colors of this card and those gorgeous roses!